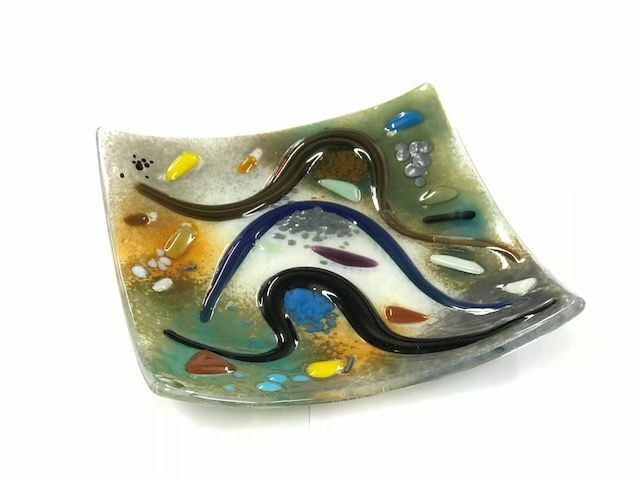 An introduction to fused glass. This is a one day fused glass workshop based in Martin's studio in the learning centre at Abbeydale Industrial Hamlet, Sheffield. This workshop is for beginners as well as the more advanced student; this workshop is run with a maximum of ten students ensuring that each student receives individual attention. Each student has use of a workbench with all the tools and equipment they will need while taking part in the workshop. All patterns and materials are supplied by Martin at no extra cost. You will have the opportunity to make a couple of window hangings, a set of four coasters and a small bowl. All pieces made on the day will be fired and available for pickup two weeks after the workshop, if you are unable to pick up your work it will be posted to you (please note a £10 postage and packing fee will apply). •	Scoring and breaking glass. •	Types of glass used. •	Materials that can be used such as frit's, powders, stringers, confetti, papers & metals. •	Techniques for different effects. •	How to put it all together. For more information about this workshop please call or email Martin via the contact details listed above. All materials such as glass are provided by Martin at no extra cost. Lunch is not available in Martin's studio, it is recommended that you bring your own lunch or that you purchase lunch at the cafe. Please note that the learning centre cafe is closed on Friday, teas and coffees are available through the day and a selection of cakes will be served at lunchtime.